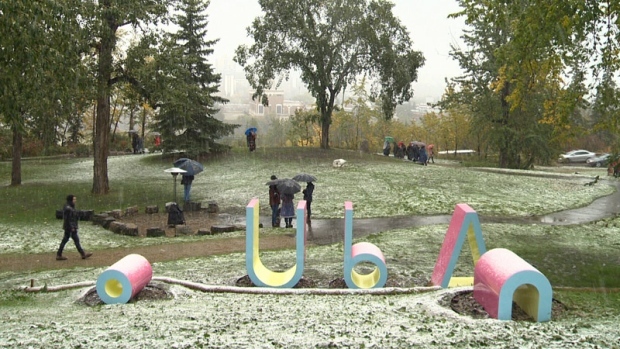 Edmonton's first Indigenous art park, which is named ᐄᓃᐤ (ÎNÎW) River Lot 11∞ and located in the Queen Elizabeth Park, features six art installations by Canadian Indigenous artists. Edmonton’s first Indigenous arts park opened Saturday at Queen Elizabeth Park. River Lot 11 acknowledges the land was originally home to Métis landowner Joseph McDonald. The park is said to improve the river valley’s path system and features six permanent art installations by Canadian Indigenous artists. At the park’s grand opening Saturday, Mayor Don Iveson said it would help Edmonton residents appreciate the history of the land. Scholar and artist Candice Hopkins, of the Carcross Tagish First Nation, curated the park’s installations. The work of two Alberta artists — Tiffany Shaw-Collinge and Amy Malbeuf — is featured in the space, alongside that of Duane Linklater, Jerry Whitehead, Mary Anne Barkhouse and Marianne Nicolson. “ᐄᓃᐤ (ÎNÎW) River Lot 11∞ reinforces the Indigenous presence, which has been part of this place for millennia,” said Sanjay Shahani, executive director of the Edmonton Arts Council. The park was developed as part of Phase Two, a $5.3 million step in the city’s Queen Elizabeth Park Master Plan. The master plan is a 10-year guide of development of the public space. It received approval from city council in 2013, and Phase Two received $500,000 from Western Economic Diversification Canada through the Canada 150 Community Infrastructure Program.